Just getting started in electronic system design? Or perhaps you work in the industry and want a reliable, affordable supplier for all your technology needs? With a Farnell Element14 voucher, you can get stocked up on everything you need without breaking the bank. With fast access to the latest technology, a local, personalised service and expert engineer advice, the Farnell Element14 online shop has everything you need. Founded in the 1930s with two businesses either side of the Atlantic, Farnell started life with a simple mission – to help customers get the parts they needed, when they needed them. Since then, the company has grown and expanded to cover operations throughout the world, serviced from regional distributional hubs in the UK and Belgium. When the company first launched, it was delivering parts to radio engineers, and as industry has evolved so has Farnell. Today, they ship over 30,000 products every day to maintenance and facilities engineers, industrial engineers, design engineers, student engineers, and the purchasing professionals who work with them. Farnell Element14 is the modern branch of this historic company, and has been at the forefront of many innovations in technology supply. They launched the first interactive online community for engineers, created customisable online catalogues and introduced the Element14 online engineering video library to encourage learning and development. 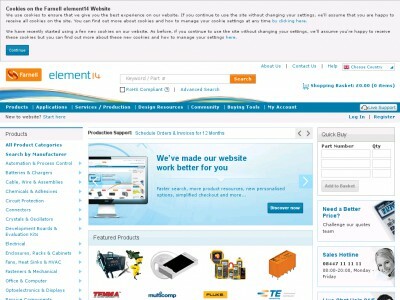 At Farnell Element14 customers will find a wide range of technology-related items, with over 650,000 products, services, software and solutions available direct from their easy-to-use website. As well as individual products the company also offers a comprehensive selection of complete design solutions, and the support of a dedicated engineering support team available 24/5 via live chat or phone. Customers can also access the vibrant online community to enjoy direct access to peers and experts plus a wide range of technical information and tools. With features such as live webinars, product road tests and busy discussions and blogs, the online community allows individual customers to increase their knowledge from the comfort of their own homes. Farnell Element14 is also a company committed to a sustainable future, having been listed on the FTSE4 Good Index and the Dow Jones Sustainability Europe Index. With a focus on driving sustainability through planet, people and principles, the company is dedicated to reducing its negative impact on the earth. Want to get shopping with Farnell Element14? With a Farnell Element14 voucher you can make big savings while you shop. Whether you're looking for individual parts for a hobby build or a bulk order for a professional job, Element14 voucher codes are a great way to get what you need without breaking the bank. Browse our website until you find a Farnell Element14 discount code that suits you, then navigate to their website to begin shopping. Click on a product or service for more information, then click 'Buy now' to purchase. When you're finished shopping, click 'Go to checkout' to complete your order. Enter your Farnell Element14 voucher in the box provided and click 'Apply voucher code'. If you've enjoyed getting stocked up on technology with Farnell Element14, why not shop for more electronic goods with Currys or Sony? Or, if those aren't right for you, you'll find plenty more stores in our Electronics section. Click 'Register' to start an account. Fill in your details and click 'Register'. Enter your address and payment details and click 'Proceed to order review'. Click to confirm your order. Delivery is free on all orders over £20. For orders under £20, a delivery charge of £3.95 applies. If you need to return a product for any reason to Farnell Element14, simply fill out the online returns form and return your item in its original packaging for a full refund or exchange. Need to contact the team at Farnell Element14? Whether you have a question about your order, want some expert engineering advice or simply want to know how you could save money with Farnell Element14 discount codes, you can contact the Customer Services department by 08447 11 11 13. Want to find out more about what's happening behind the scenes at Farnell Element14? The company maintains a profile across all your favourite social media networks. Follow them for all the latest industry news, product reviews, competitions and much more. You can also use these pages to find out more about saving money with a Farnell Element14 voucher. Don’t forget to check them regularly, as you can never be sure when a free Farnell Element14 discount code might be waiting for you! Buy now online at www.uk.farnell.com. My husband loves to tinker with electronics, but it can be an expensive hobby. That's why I was happy to discover a Farnell Element14 voucher online. At uk.farnell.com you'll find everything you need for getting started in electronic systems design – all available at a discount with Farnell Element14 voucher codes. All I did was enter the Farnell Element14 vouchers at the checkout to get a great deal – and my husband was delighted! So why not see what you could save with a Farnell Element14 discount code?